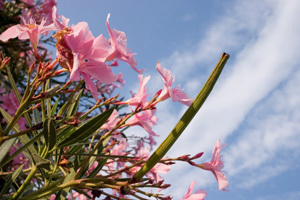 Oleander – It can cause serious issues including gastrointestinal tract irritation and abnormal heart function. Lilies – They are toxic to cats and can cause severe kidney damage. Tulips – The bulbs contain toxins that cause drooling, loss of appetite, depression of the central nervous system, convulsions and heart abnormalities. Cocoa mulch – Reacts like chocolate to dogs causing vomiting, diarrhea, muscle tremors, hyperactivity and seizures. Azalea – May cause vomiting, diarrhea, weekness, and other issues. Stay safe this spring and for more information about toxins in plants, visit the ASPCA.